Israeli forces, along with Israeli army engineers, raided the Abu Hmeid family home, predawn Tuesday, in the al-Amari refugee camp that is located in the central occupied West Bank district of Ramallah. Locals said, according to Ma’an, that Israeli forces and army engineers raided the al-Amari refugee camp and inspected the house of Umm Nasser Abu Hmeid, mother of four Palestinian detainees; a fifth is accused of killing an Israeli soldier and another was killed by Israeli forces in 2002. Troops raided and took measurements of the house, in preparation to demolish it. Confrontations broke out between Palestinian youth and Israeli forces, following the raid; no injuries were reported. Abu Hmeid’s son, Islam, was detained by Israeli forces in June, charged with stone throwing and accused of killing an Israeli soldier during confrontations in which he threw a stone on the soldier’s head, later killing him. 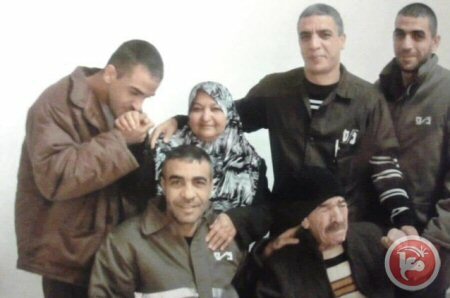 Abu Hmeid’s mother has four sons, Nasser, 37, Nasr, 35, Sharif, 29, and Muhammad, 24, who are currently serving multiple life terms in Israeli prisons for resisting Israeli forces during raids or clashes; Abu Hmeid’s sixth son, Abed al-Munim was shot and killed by Israeli forces in the Qalandia refugee cam,p in 2002. The Israeli courts typically demolish the family homes of Palestinians involved in attacking Israelis, as part of its collective punishment policy against the Palestinian people. Israel has come under harsh condemnation, over the past several years, for its response to attacks committed by Palestinians on Israelis, which rights groups have said amounted to “collective punishment” on family members and entire communities, in a clear violation of international law.